Integrate for free your Magento ecommerce with MDirector, the most advanced and simple marketing & sms tool of the market. Why integrate your Magento ecommerce with MDirector? Thanks to more effective email marketing & SMS campaigns, you will boost your ecommerce sales right from the first moment. Integrate your client database and send your email marketing & SMS campaign right away! Assign your Magento group of clients to a specific MDirector subscribers list to do customized and segmented email marketing actions. With MDirector advanced reporting you can manage sales information (Number of products sold, total sales value, and product ID) of each of your sending, just by activating the sales pixel in this module. NEW! – Synchronization MDirector unsubscription from Magento, with an automatic process: once a day the unsubscription are synchronized and you will have both systems up to date. NEW! – Welcome email to your news subscribers. Now, from MDirector, you will can send an welcome email to all your subscribers that register through your online store form. The module “Magento Extension” for MDirector newsletter & email marketing allows you to send information stored in Magento to your clients. 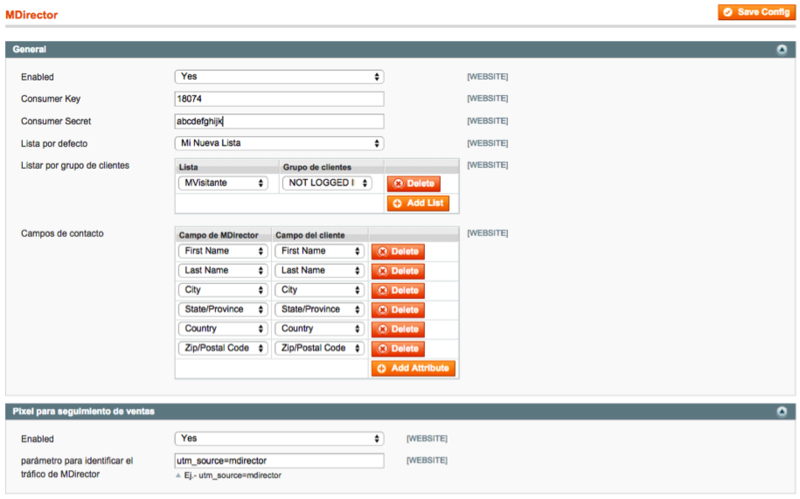 You will be able to assign them to specific subscribers’ list in order to send campaigns with MDirector afterwards. Furthermore, you can add a follow-up pixel to gather all the information about clients´ purchase and you will get all the information to perform specific marketing actions based on each customer. On the one had, in your Magento´s dashboard you will be able to identify the traffic coming from a particular email marketing campaign you have made in MDirector. On the other hand, the pixel will allow you to view the purchases made by your ecommerce Magento customers in the statistics dashboard of MDirector. Synchronize now your subscribers and you will always have your MDirector database updated to send email marketing & SMS campaigns, thus saving time and reducing risks. Stop thinking too much and start using the most simple and professional tool of email marketing & SMS management. It is designed for people to use it to get the best results! * Compatible with versions 1.8x and 1.9x of Magento CE. * Compatible with versions 1.11x, 1.12x, 1.13x and 1.14x of Magento EE. 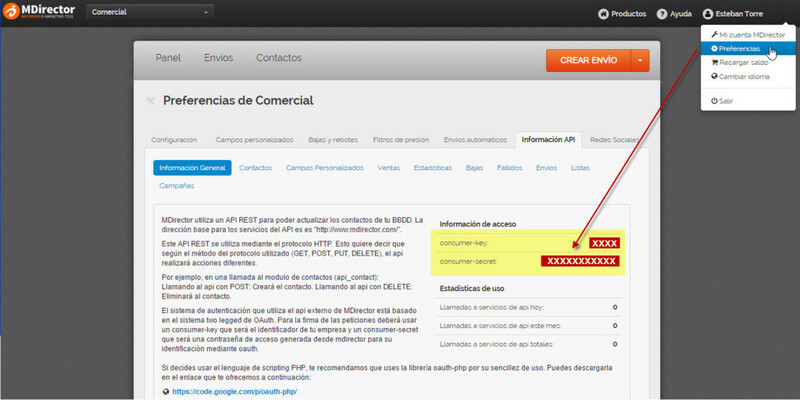 * Following Magento´s guideline, we recommend to make a BACKUP OF THE FILES AND THE DATABASE before any new extension. To be able to use the extension it is necessary to have a created account in MDirector. The credentials to run the extension are obtained with an Advanced or Premium account. 1) I already have an Advanced or Premium MDirector account. In that case you only need to request access to the API, as shown in the picture below. 2) I have a Starter account. You just need to update the type of your account to Advanced or Premium and follow the previous step. 3) I don´t have a MDirector account. In this case you need to create an account from MDirector.com. You will register with a Starter account and then follow the steps in previous point, 1 and 2. Enabled: Allows to activate and disable the extension. Consumer key: Indicated the necessary key to connect with MDirector (Provided at MDirector administration panel). Consumer secret: Indicates the secret number needed to connect with MDirector (Provided at MDirector administration panel). Default list: Indicates the default list in which the extension will store the clients’ information if it is not assigned to a group of clients. List by group of customer: Allows to assign the lists in MDirector with group of clients in Magento. Subscriber fields: Allows to relate the subscriber fields of MDirector database to the subscriber fields of clients in Magento. To add a new relation select “Add Attribute” and select the fields you want to relate. A follow-up pixel is an invisible image that allows to compile information about the purchase of each customer. Enabled: To activate and disable the insertion of the follow-up pixel.